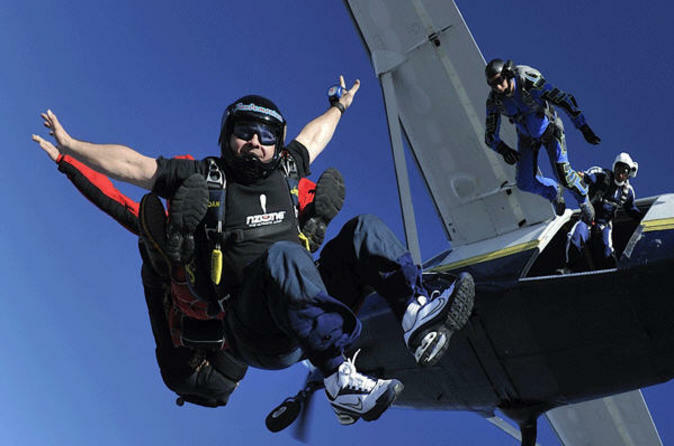 Experience the thrill of free falling on a tandem skydiving adventure in Miami! Safely strapped to your professional skydiving instructor, get the ultimate adrenaline rush during a 60-second free fall at speeds up to 120 mph (193 kph), followed by a peaceful parachute descent with breathtaking views. After pickup from your Miami hotel, you’ll arrive at the drop zone to be equipped with your skydiving equipment – a jumpsuit, soft helmet, goggles and harness. You’ll be double-checked for safety and receive a briefing on the proper skydiving procedures, and then it's into the airplane to get ready for take-off! Your plane will roll down the runway and lift off, taking you to the appropriate altitude from which to jump. As the time approaches, your instructor will give you one final check and then, via four attachment points, he or she will secure you to his or her own equipment (each upper attachment is capable of holding 5,000 pounds (2,250 kg)). The door will open and out you go! For 60 seconds, free-fall at speeds up to 120 mph (193 kph), feeling a total sense of freedom while securely harnessed to your personal instructor. The thrilling free fall will end with the pulling of the parachute and the tranquil ride back down to solid ground.